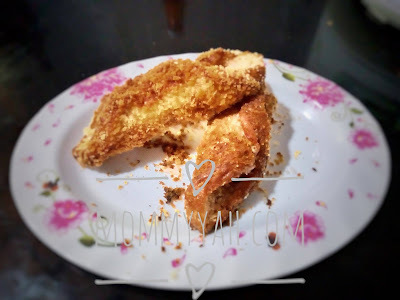 Ham and Cheese roll is one of my kids' favorite "baon" to school and I love it cause it's very easy to prepare. My kids are very active and based on the USDA, active kids whose age ranges from 7 to 12 need 1800 to 2400 calories per day. A single roll of ham and cheese may contain 400 calories which is around 40 to 60 % of their recommended intake of calories which is high enough considering the other calories that they will consume for the rest of the day. When making ham and cheese roll, I always make sure that I am making it in a healthy way. I can minimize the calorie content by choosing the best ingredients available in the supermarket. Bread - Instead of using white bread that's made from refined flour, I use wheat bread (Gardenia wheat bread is great for me) as it contains whole grains which is good in digestion and lowers the risk of heart attack to 20 %. Wheat bread has so many health benefits such as B vitamins, vitamin E, magnesium, phosphorus, iron and zinc, see this link to learn more about the benefits you can get from eating wheat bread. Ham - I always check the nutritional label of different ham brands. Studies show that smoked ham has less fat content. A regular ham may contain 4.8 grams of fat per slice while you can get 96 % lesser fat when you go for pre-sliced smoked ham for your ham and cheese roll. Cheese - I don't put so much stress on cheese as I only put some of it in my ham and cheese rolls. My kids are not a cheese lover, so a very thin slice for them is enough. However, if you really want to prepare a healthy food for them, I would suggest buying Swiss cheese which is popular for its holes. Swiss cheese is high in protein and Vitamin B12 and also contains less fats compared to cheddar cheese. Veggies - this is optional but putting lettuce on my ham and cheese makes it healthier as lettuce contains with so much health benefits like Vitamin K, A and C, it is also rich in manganese, potassium and iron. Remove the dark ends of the wheat bread. Heat the canola oil in a frying pan. Lay each wheat bread slice, flatten by pressing. Arrange the ham and cheese on the bread. Roll the bread until the filling is covered. Lock with a toothpick. Dip each rolled bread in beaten egg then roll in the bread crumbs. Fry in moderate heat until the color turns golden brown (approximately 5 to 7 minutes). Place a thick paper towels in the strainer then place then cooked rolls and let it drains. Arrange in the plate, put some lettuce if desired. For the dipping sauce, simply mix shredded lettuce, pepper and mayonnaise to make it look like coleslaw, sprinkle with salt to taste.